Made with proprietary memory foam materials for the ultimate truly wireless earphone upgrade. Enhance your listening experience today. Comply™ TrueGrip™ Premium Foam Tips are designed to fit on certain truly wireless earbud models (see below for list), and feature a uniquely tapered designs that seals the ear canal seamlessly to block out external sound for better sound and call clarity, allowing you to experience the most optimal audio experience. Additionally, our TrueGrip™ tips feature a shorter design than conventional tips, allowing for a perfect fit within the charging case without sacrificing in-ear comfort. Whether you’re using wireless earphones to work out, jam out or zone out during your daily commute, TrueGrip™ tips are the best way to get the most out of your audio. The future of wireless listening awaits you, so cut the cord today. 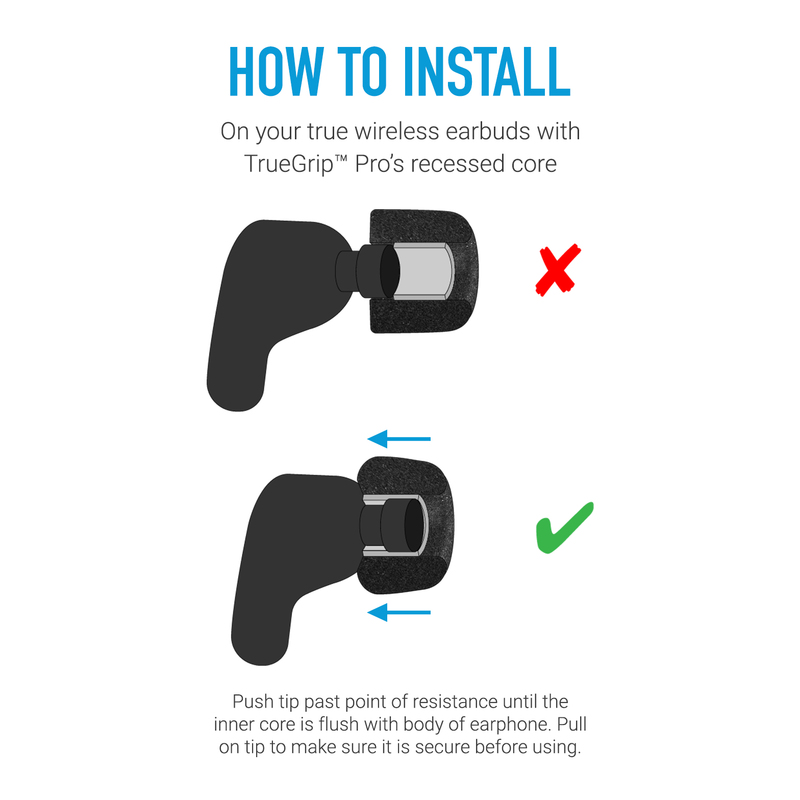 TrueGrip™ tips are compatible with the Anker Soundcore Liberty Lite, Jabra Elite Sport, JBL Free, RHA TrueConnect, Rowkin Ascent Charge, Rowkin Ascent Micro, Sennheiser MOMENTUM True Wireless, Sony WF-1000x, Sony WF-SP700N, Enacfire E18 truly wireless earphone models and more. Comply™ tips are made from body-heat activated memory foam that’s 30x softer than silicone. Our TrueGrip™ tips create an ultra-soft and comfortable fit that snugly fits into the exact dimensions of your ear. Best of all, the incredibly comfortable softness of our tips greatly reduces earphone irritation and fatigue, allowing you to immerse yourself in your audio for even longer.